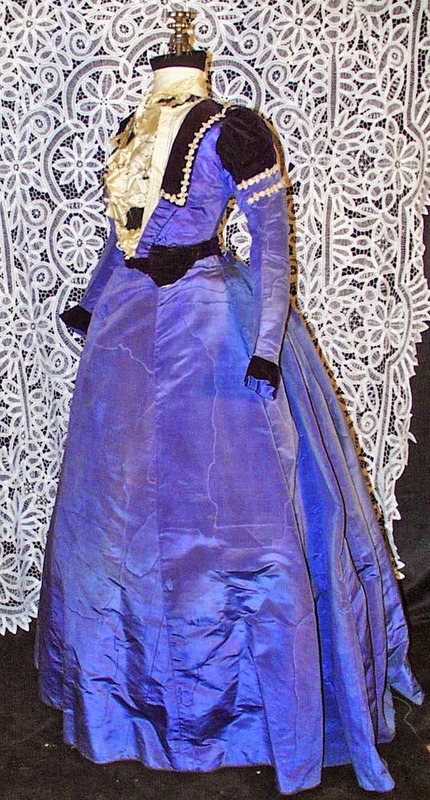 This is an attractive calling outfit of the 1890's period, that a mid to upper class woman would wear. 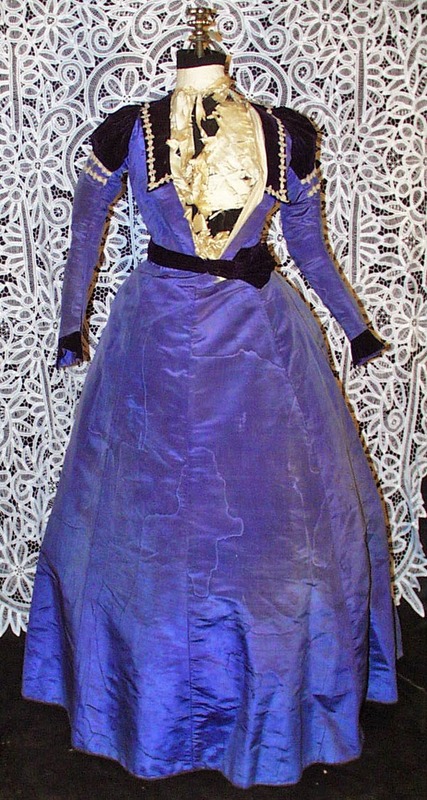 A regal 1890's - 1894 light purple changeable to blue silk moire and velvet 2 PIECE bustled gown de-accessioned from the Rochester historical museum in New York state. 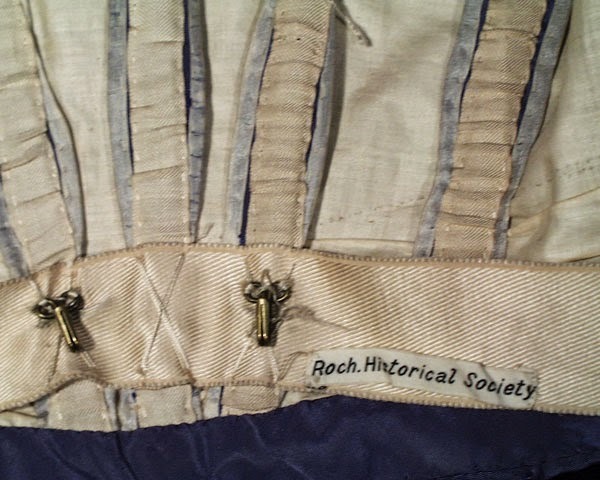 The gown still retains it's original Museum ID catalog tag, inside as well as string tags. 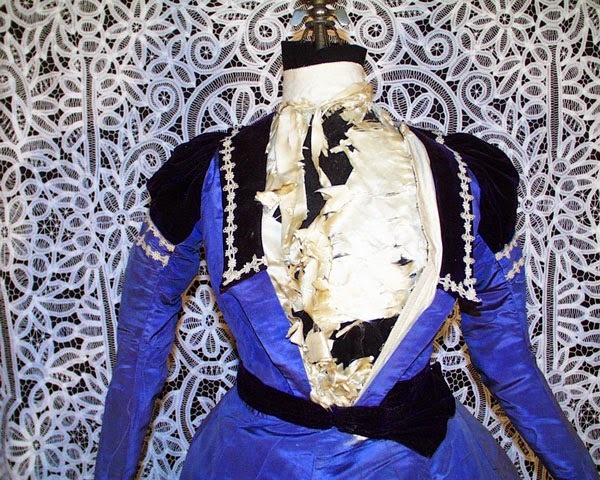 The bodice has dark purple velvet draped panel lapels on each side that extend over the shoulders into the collar and decorated with machine lace trim. 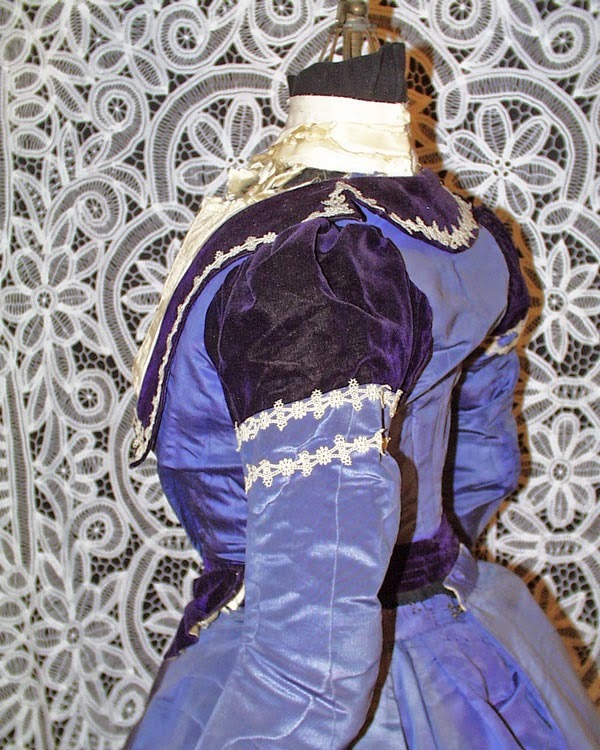 The cuffs are velvet as well as bottom of bodice closure belt. 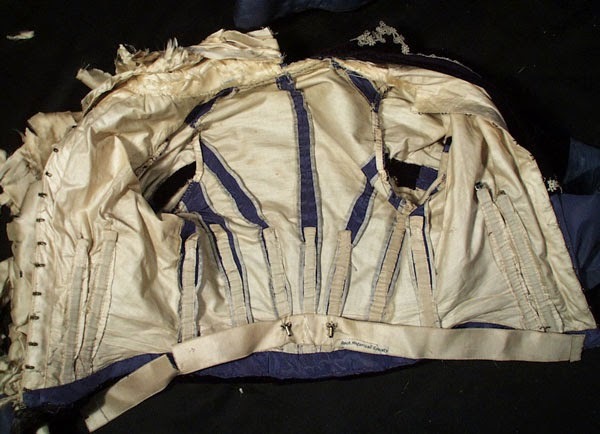 The bodice is lined with white polish cotton and the jacket still retains all its original front metal hook and eyes, and contains 11 covered metal stays. The front silk has shredded totally and needs to be replaced. The sleeves have a upper arm puff with a slight curve and tapering at the elbow. I find only a few minor problems with the skirt. The skirt closes by hooks and eyes at the back and gathers with pleats in the back for a nice fall. The rear puff enhances the outfit nicely. The skirt is lined with white polish cotton. 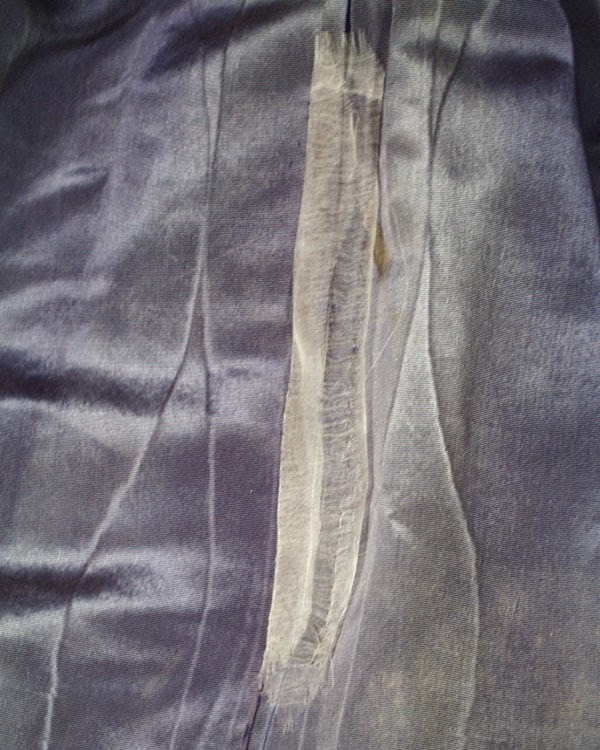 The bottom of the skirt has a few small areas stains, and areas of roughness at edges. 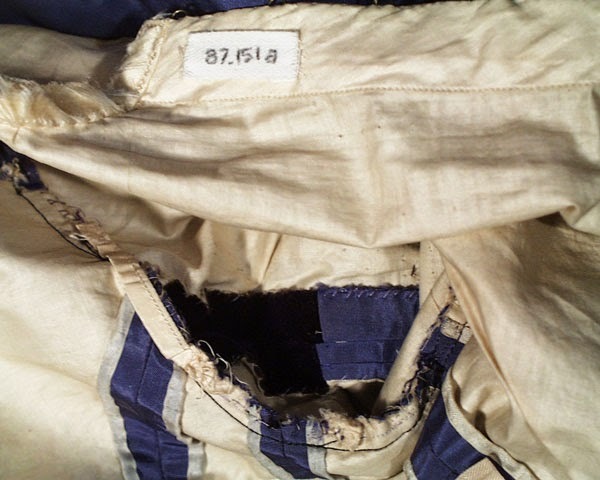 The skirt has an area of museum restoration with a gauze stabilizing material to stop a split on a seam, as seen in last photo. The skirt has a few very small pin holes scattered about as well as vertical fade lines. 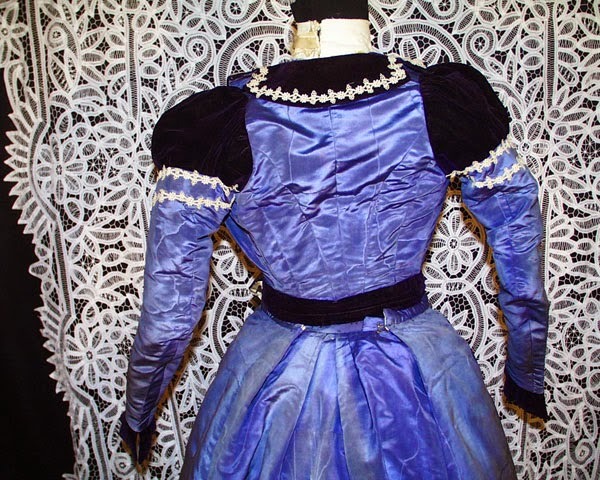 BODICE: Bust 27", Waist 27", Sleeve Length 25". Front skirt length 44-1/2" Back length 45", waist 30" Circumference 168" . 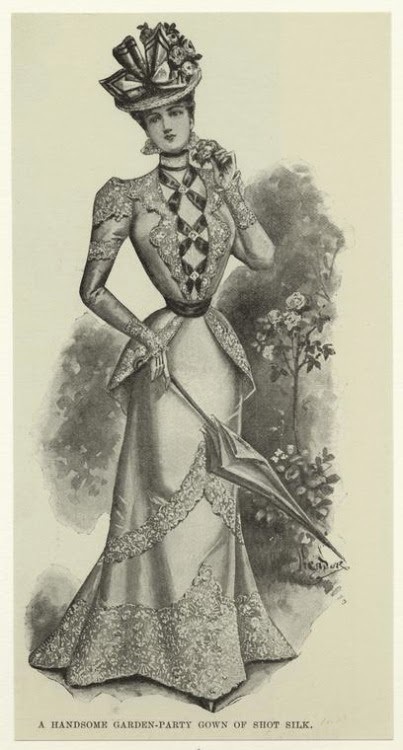 The early 1890's are when the sleeves got to ridiculousness. These are not sleeves of ungodly size. They actually look pretty normal and even cute to my modern eye. 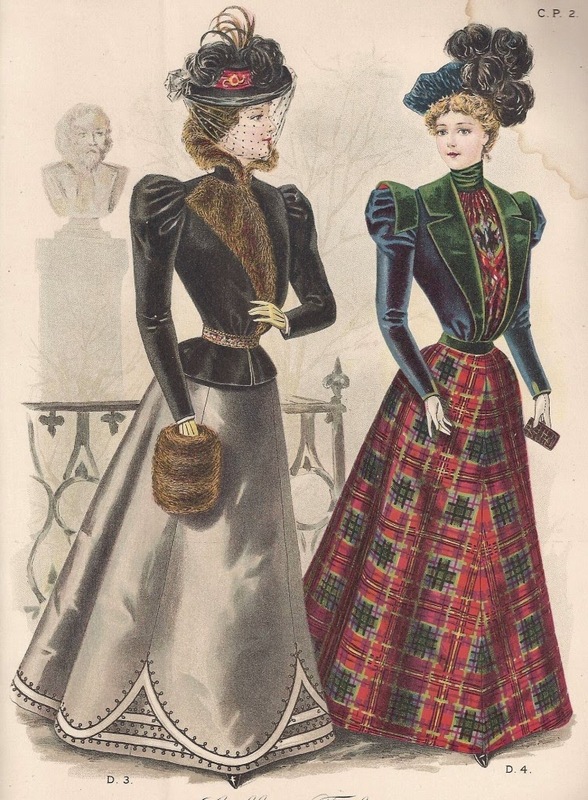 Below are two fashion plates from 1898. Notice on the plaid dress, how a contrasting fabric is used for the sleeve cap and the collar-similar to this extant one. 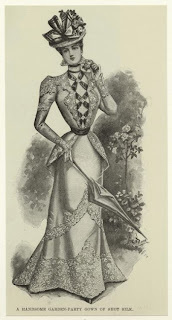 It looks like a lace is used for the sleeve cap and collar on the black and white drawing. The display of the extant one isn't showing the period silhouette. I will never understand the "need" to show bustles where there were none.